84124 • Tamiya Wolf WR1 • F104W • (Radio Controlled Model Archive) • RCScrapyard. RCScrapyard ► Iconic Vintage Radio Controlled (RC) Model Car Archive ► Tamiya Wolf WR1. #84124 Limited Edition. 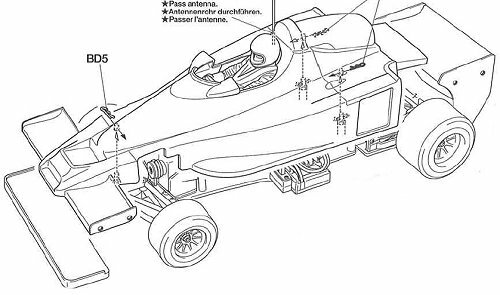 F104W Chassis. Released by Tamiya on July 17, 2010, the Wolf WR1 kit (#84124) is No.624 in the Limited Sale Series, based on the F104W chassis. The model is of the Wolf WR1, that was driven by Jody Scheckter in the 1977 Formula One Championship season. According to Tamiya, the basic F104 is 180mm wide and the F104W is 205mm wide, making it 25mm wider. This is achieved on the rear by simply placing the hub mount deeper inside the rear wheels and on the front by utilising the F103 configuration. The twin deck FRP (Fibreglass Reinforced Plastic) F104 chassis design used for the F104W, provides a more rigid structure than its 2WD predecessors. Like the majority of Tamiya budget Radio Controlled Models, the model kit comes with plastic and sintered brass bush type bearings, that after a short while, when dust and grit get into them, actually wear into the metal shafts - if you are building this kit to race seriously, these should be discarded and replaced by a full set of steel shielded ball bearings.